Discussion in 'TV & Media' started by tharpdevenport, Jan 19, 2019. Poll closed Jan 24, 2019. 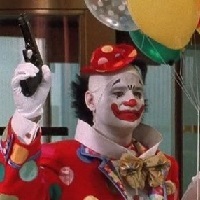 Okay, no clowning around -- time to vote. I think I'm going to reduce the voting days down to five. A week seems too long. So happy voting. 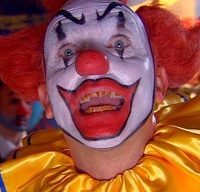 And remember: If you don't vote, I'll have to sick Captain Clown on you. I voted for clowns....so, just like going to the polls in November. Random_Spock and Orac like this. Less than twenty-four hours remaining to vote. 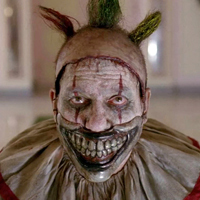 Everybody loves to vote for a clown, so why don't you? Voted! So many good entries. It was hard to choose. Congrats to Random_Spock. The next contest is your should you chose to do it. Everybody votes for a Tim Curry. Thanks! I'll see what I can come up with.